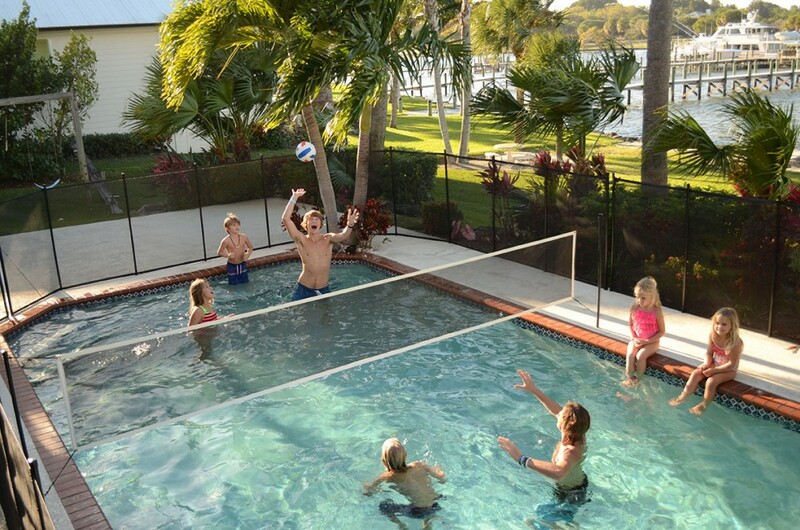 Your family will enjoy hours of fun in the water with our pool volleyball net. 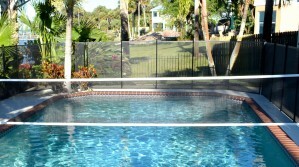 It can be easily and affordably added to your removable pool fence or stand alone. 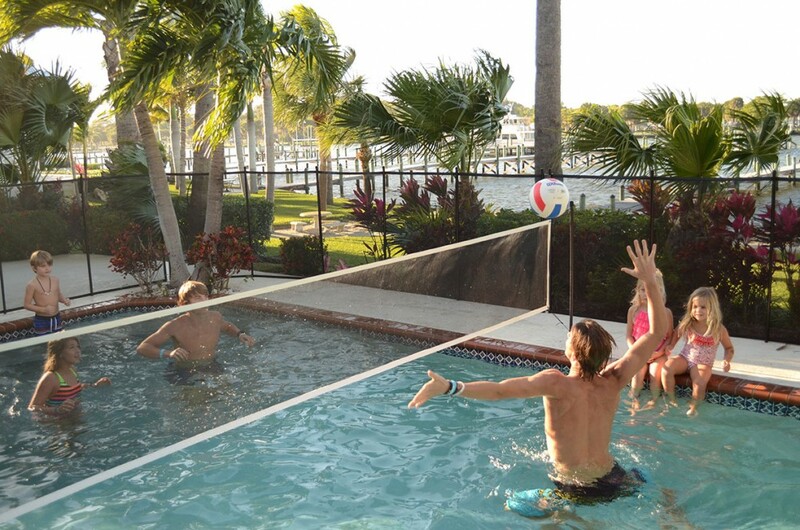 Add Hours of Family Fun with a Pool Volleyball Net! Our volleyball net design allows you to easily set up or remove your net in minutes. No more heavy bases to worry about, and no floppy nets, even after years of abuse. Plus, impact-absorbent mesh provides a soft cushion when a player lands in the net. 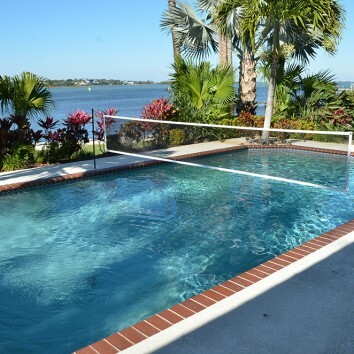 Most pool volleyball sets require bulky, awkward bases that have to be rolled into position beside the pool to get the net straight and the playing area even. Your Protect-A-Child volleyball net is connected to strong fiberglass posts that are inserted directly into your deck, eliminating the hassle of rolling heavy bases onto the deck and stubbing your toes. Plus, everything is pre-measured so the net goes up straight and taut in a snap! When you add a volleyball net to your new, secure Protect-A-Child pool fence, you get a complete volleyball arena. Ever get tired of having to climb out of the pool and fetch the volleyball from the yard when someone bumps it out of bounds? 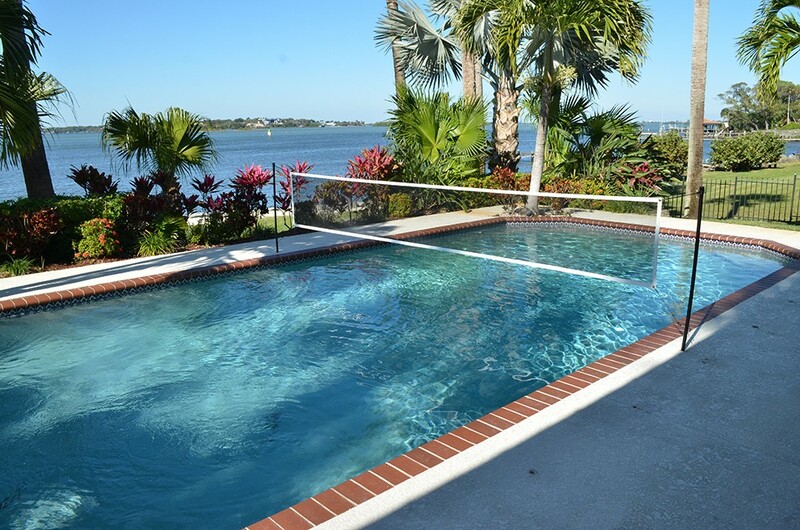 Your pool safety fence keeps the ball contained to the pool area, and it is more likely to bounce right back in the water when hit onto the deck. Volleyball nets can take a lot of abuse from getting hit with the ball as well as jumping and diving players. 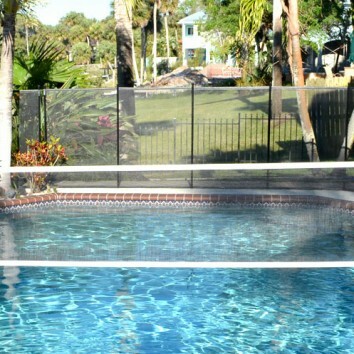 When you choose a Protect-A-Child pool volleyball net, you get our impact-absorbent mesh connected to strong fiberglass posts. This keeps your volleyball net taut and attractive. The mesh of your new volleyball net is made with 1,000 denier PVC-coated polyester mesh—the most UV resistant mesh available. It has a burst strength of over 400 lbs. Plus, the mesh’s basket-weave construction gives it self-healing capabilities that allow your net to maintain a perfect, attractive shape. As an extra benefit, your mesh net also has antimicrobial coating! The volleyball net was super easy for me to setup and I love watching my kids play all day! So fun! 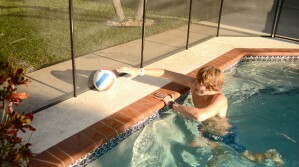 Had a blast with the volleyball net on Sunday. The fence kept the volleyball in the pool area as well, so no more running after out of bounds hits... we are enjoying our pool even more this summer!